Love It Landscaping & Styling For Miracles! Love It Landscaping and Love It Styling have organised a night of dancing, auctions and raffles at Crown to raise much-needed funds for Miracle Babies Foundation. 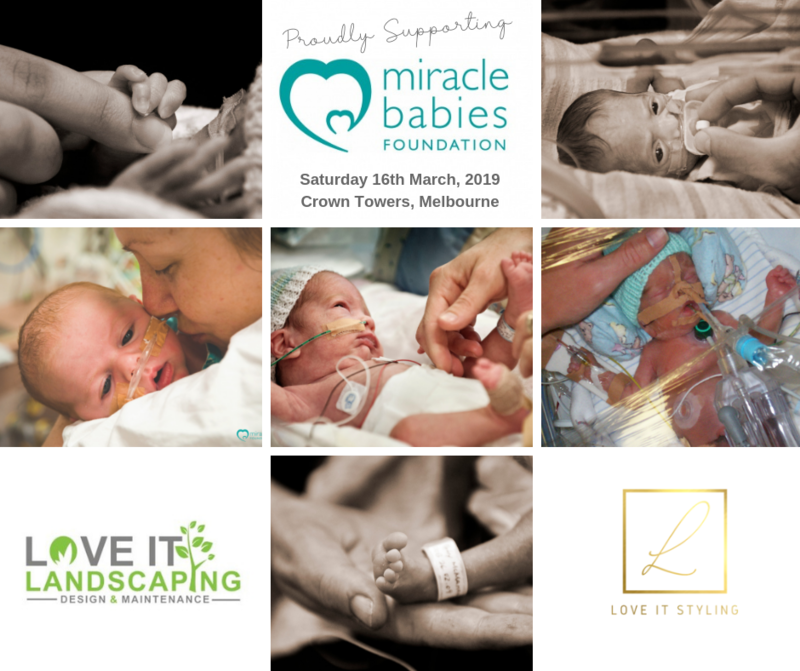 Miracle Babies Foundation is Australia’s leading organisation supporting premature and sick newborns, their families and the hospitals that care for them. Funds raised by Miracle Babies go directly towards programs to support families including a 24-hour support line, as well as providing much-needed equipment to Australian Neonatal Intensive Care Units and towards research. Troy and I (Rebecca) have had 3 premature babies. Our twins were born at 24 weeks ( 4 months early ). Our son Zane sadly lost his battle after 2 weeks and Bailey was in the hospital for over 6 months before we got to bring her home. She has had a very long journey to get to where she is now 7 years later but is doing amazing! Two years after the twins were born, our son Levi was born at 29 premature. His birth was life-threatening to both Levi and I, however, he is now 4 and kicking goals! As you can see, this is a cause so very close to our hearts. We have organizations like Miracle Babies Foundation to thank and the amazing work they do. We are very passionate about raising funds for this cause and trying to give back.